The duo had a decision to make: Wait for the perfect candidates to apply, or hire the candidates with the most potential and transform them into cannabis experts. They chose the latter. 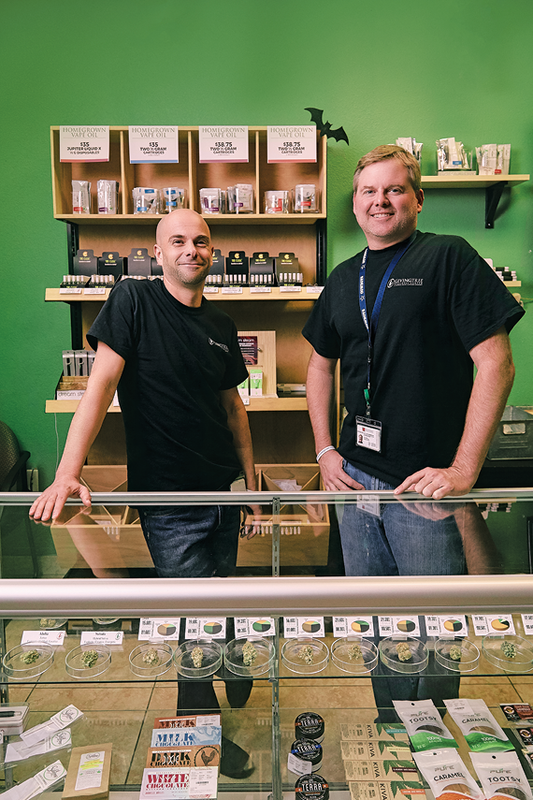 Budtenders, or patient consultants as they’re called at The Giving Tree, are largely responsible for the first impression a patient develops about a dispensary. Morris, the company’s general manager, and Leone, the assistant manager, realize that how their consultants treat patients is crucial to both the success and reputation of the company. A 2015 poll conducted by Conversion Research revealed 54 percent of millennials, 50 percent of Gen Xers and 52 percent of baby boomers stopped doing business with a company due to poor customer service. So together they created the company’s new immersive training program, dubbed GT University, which arms new hires with the customer service skills and cannabis knowledge required to provide better consumer experiences. “Our interest is making sure that by the time we put somebody in front of patients that they have a confidence level, a knowledge base and a delivery that matches who we are and how we want to present in the community,” Leone says. It takes four to six days to complete GT University and be cleared to work in the dispensary unsupervised, because as Leone says, “There is just a wealth of information to absorb coming into this industry.” During those days, a new hire is exposed to every facet of the dispensary, starting with the front desk, and ending with a tour of the company’s grow and extraction facilities in Phoenix. Day One is orientation. New hires receive course training materials and learn the company’s history, mission statement and how it positions itself in the industry. “That first day is really an introduction into … the culture that they’re about to become a part of,” Leone says. Trainees experience their first taste of dispensary life on Day Two when they shadow the front desk. They observe the different processes for checking in a patient, the correct way to answer the phone and how to interact with patients. “The front desk part of it really has to do with how we create a welcoming environment for everybody that walks through the door,” Leone says. During these first days, The Giving Tree clarifies a misconception many new employees harbor, which is that medical cannabis is simply a cover for people to get high. “One of the purposes of our training, from start to finish, … is to get [new employees] into the culture of not only are we truly a medical state, but we are really serving a clinical and a health need for people,” Leone says. Day Three of GT University is the most important, Leone says. It’s a classroom day, off the dispensary floor, called PC (patient consultant) 101. PC 101 is a deep-dive into cannabis and product information. Trainees review symptoms and ailments each product can be used for, as well as potencies and price points. “We are forming them into experts not only in cannabis in general, but specifically the products we serve,” Leone says. Classroom training allows trainees to ask questions without feeling like they are interrupting a transaction or negatively influencing a patient experience. By a trainee’s first shift, “they have a basic foundation at least of what they are going to see in the dispensary … and what they’re going to hear other patient consultants talking about,” Leone says. Language is a huge part of GT University’s curriculum and The Giving Tree’s identity. “There is just a way that you talk about cannabis professionally rather than how you might talk about it in your personal life,” Leone says. He adds that forming the habit of using professional language can be challenging for trainees. GT University stresses that message delivery is as important as the words. A PC might address a 25-year-old with cannabis experience differently than he or she would a 65-year-old without cannabis experience. The Giving Tree does not provide employees a list of buzzwords to avoid, however. After PC 101, trainees participate in “dispensary shadow” and “dispensary reverse shadow” days. 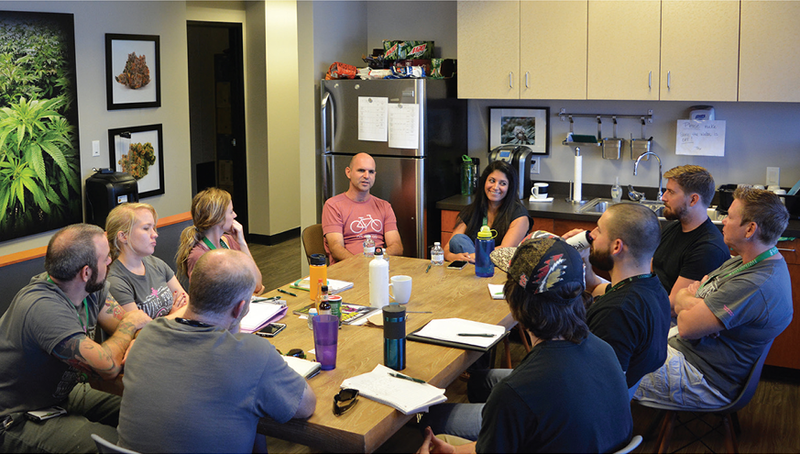 For dispensary shadow day, trainees follow their trainer during a shift, ask questions, take notes and absorb the culture of the dispensary. The reverse shadow day allows the trainee to take the reins under the trainer’s supervision. They are expected to lead and close transactions. Management uses this as an opportunity to see how much information the trainee has absorbed. Last is a “round robin” day. The employee visits the company’s cultivation and extraction labs in Phoenix. Trainees receive a tour of the facilities, which includes packaging and inventory, so that they can “become a larger part of the culture, and begin to understand more thoroughly what we do and how we position ourselves,” Leone says. Trainees also take two written tests. The first, a two-pager called “the front desk test,” covers basic information such as the dispensary’s address, phone number and names of the management team. It also covers patient profile-building and menu management. A four-page “patient consultant test” follows. It covers the history of cannabis, product information and customer service scenarios. Trainees must receive a minimum score of 85 percent on both exams to work unsupervised in the dispensary. GT University has been operating for roughly six months and has groomed 10 patient consultants between the two locations, according to Morris. “We can have a patient consultant that has been here one week, and [we] feel comfortable with them to sit down with a new patient and talk for an hour,” he says. Morris has been with the company since its inception in 2013 and says both the training program and the culture it has created are the two things he is “most proud of.” Part of that culture is equipping employees to succeed.